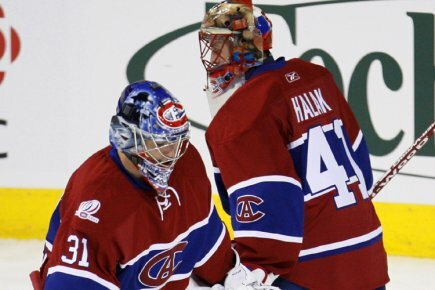 Halak and the Habs worked a Game One strategy to perfection. They shut down Ovi, not even allowing him a shot, and shockingly won the opener. Since then, Washington proved that they have just too many weapons for Montreal to contain. Backstrom's hat trick in Game Two highlighted a massive comeback victory for the Caps, that led Alex the Gr8 to question Halak's nerve afterward. Everyone seemingly chipped in for a blowout win in Game Three in Montreal, which chased Halak from the Habs net and it is now up to Carey Price to work a miracle here on out. Prediction Update: Still legit. Caps in five. We are proud of this one. The Philly owned Jersey all regular season and it looks as if that will remain true in this series. Boucher has played quite well in net for the Flyers, but the same cannot be said of the Devil's "god of goaltending" Marty Brodeur. He has not been effective in the post-season for quite a few years now. Mike Richards has come to play and has been a difference maker. The Flyers now have a commanding 3-1 series lead. This one is over, time to test themselves against the Caps soon. Prediction Update: Still legit. 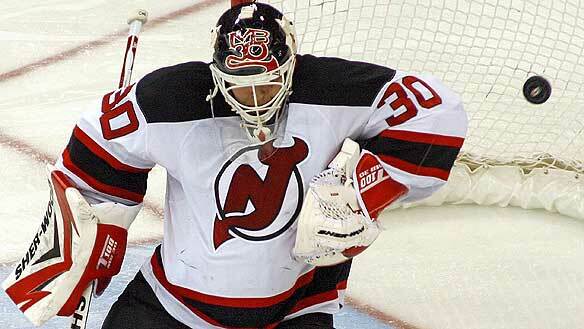 Devil's likely take game five with Gagne and Carter out for Philly. Done in six. Who needs Phil Kessel or Marc Savard when you have Tuukka Rask? Through three games Rask has outplayed Ryan Miller! Mind you, it's a close competition, as the two have split a pair of 2-1 squeakers. Game Two is the difference in this competition, when Boston scored five goals in a come-from-behind win that stunned the Buffalo crowd. Tonight's game will obviously be pivotal. Boston has the momentum, but Buffalo has the desperation. Prediction Update: Still legit... but barely. The Bruins have a lot going their way, and we are tempted to switch, but, why do that until we have to admit our pick is wrong? We admit it, we were right about this getting ugly fast! Ruutu, Neil and Cooke have not disappointed, but Sutton, Winchester and Rupp have been all too willing to oblige when the going gets nasty as well. The Sens took advantage of a not-ready-for-primetime Fleury in Game One, but Sidney Crosby has played like a man possessed. He has been dominant in every zone, particularly on the score sheet. His supporting cast has chipped in regularly. The defending champions will not be denied in this round. Prediction Update: Still legit. On target. Pens in five. Yeeesh! San Jose playoff hockey... it can make you sick! If not for Devin Setoguchi's and Joe Pavelski's OT heroics, the Sharks would have fallen victim to an Avalanche sweep! Yes, the four games have been that close... decided by one goal each time, three of which have been decided in overtime. 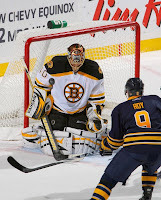 Like the Bruins/Sabres series, this has been a goaltenders battle. The Sharks have not conquered their post-season demons and the series could very well go to the wire. Prediction Update: Not close. Sticking with San Jose, but in seven. As Dmitriy pointed out, we did not show Nashville the proper respect they deserve; however, neither did Chicago! The Predators lead this series, despite missing the services of their top scorer Patric Hornqvist. Preds netminder Pekka Rinne has been as outstanding as fellow Finn Antti Niemi has been inconsistent for the Hawks. Martin Erat has done his usual job of terrorizing Chicago, while Blackhawks top guns Hossa, Toews, Sharp and Keith have been nearly invisible. The Hawks handled the Predators quite handily in the regular season, but Nashville has raised its game with the stakes. Prediction Update: Not close. Toews and Co. get it together... Hawks in seven. This has been the battle that we believed it would be. The Kings have found a different potential hero each night, while the Canucks have relied solely on the stick of Mikael Samuelsson. The Kings and Canucks, both have had strong games to date, but the Kings seem to have a bit of an edge. Roberto Luongo has gone the way of his Team Canada counterpart, Brodeur in recent playoff appearances, and he has not been very sharp thusfar. Still this looks like it will go the distance, and it's completely up for grabs. Prediction Update: Still legit. 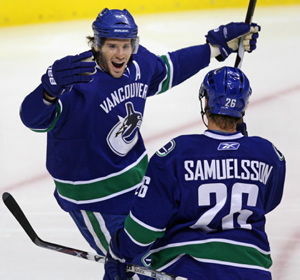 We will stick with Vancouver in seven. After a very, very rocky start, Detroit fans were calling for their playoff wizard... of Oz. However, Jimmy Howard may have silenced his critics, just as he did the sticks of the Coyotes in Game Four, with a shut out victory to even the series. Am I wrong "Angry Dave"? If Phoenix is going to pull out this series, they will have to do it without long-time captain Shane Doan. The Wings have too much experience and firepower to go out quietly in round one. Zetterberg, Datsyuk and a high flying Valtteri Filppula are on their game, and will prove too tall an order for the Coyotes without their leader. Prediction Update: Still legit. We will stick with Detroit in six.